A Powerful, Easy-to-Use School Bus Routing, Scheduling, and Planning Solution. Manage your transportation operation more effectively. Routefinder Pro is one of the most intuitive methodologies for transportation routing, scheduling, and planning for school transportation management and attendance zone planning. Increase efficiencies, enhance services, and reduce costs. You can select a geographic area or an entire trip to automatically modify stop sequences based on time or distance. You also can generate two alternative ways to run a trip, either by fastest time or shortest distance, to determine which option is best. In addition, you can select any number of approved stops, or any map points, including students’ pick up and drop off locations, in a geographic area to create a new trip and automatically sequence it based on optimal time or distance. Incremental savings in travel time or distance in a selected geographic area yields efficiencies and significant savings over time without causing community disruption. Set-up your Routefinder Pro Workspace just the way you like it, and then save it so that you can return to it at any time. Comprehensive data enable you to compare actual trip and student transportation information in relation to district policies. For example, you can determine where student transportation deviates from district policies, such as the walk-to-stop policy, or ride time policy. Small modifications in these areas may lead to increased efficiency and lower operating costs. You also can determine which trips deviate from district policies by analyzing cumulative attendance and historical information on trips. This can yield patterns and trends that may help consolidate trips and yield efficiencies and cost savings. A summary bar incorporated into every grid allows you to automatically view and analyze selected fields or columns of data as an average, count, maximum or minimum assigned, and sum. You also can view and analyze multiple data sources for a comprehensive understanding of your entire operation. Understanding your current operation and then analyzing it for efficiencies may yield significant savings over time without causing community disruption. Continually upgraded to respond to customer requirements, core features in Routefinder Pro enable you and your staff to tailor a solution to precisely meet your objectives. The features in Routefinder Pro empower you to meet virtually every school transportation and communication challenge. If you have GPS units installed on your fleet, Transfinder’s GPS Connect (formerly Busfinder) GPS interface provides your district with an analytical tool beyond compare. GPS Connect displays real time or historical GPS data simultaneously with planned routes on the same map, while in routing mode. This enables you to adjust your routes in a simple, one-step process. In addition, GPS Connect sends alerts for any excessive deviations in posted speed, time, or distance. Compatible with most of the leading GPS units currently in use, GPS Connect is invaluable for enabling you to achieve the greatest benefits from your investment in GPS hardware. Routefinder Pro comes equipped with an innovative GeoInfo Toolbox that enables you to outline a section on the map based on a Point, Walkout, Radius, Region, or User-drawn Area. You can then view all the data associated with the selected section, including students, schools, streets, addresses, hazards, and stops. With the GeoInfo Toolbox, you can analyze data quickly and make adjustments to improve performance or service, and to reduce costs. 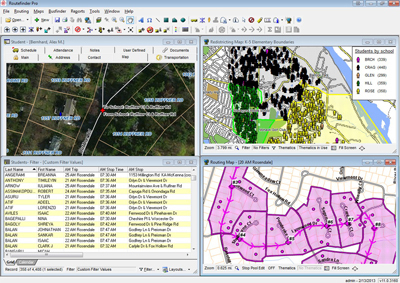 The Geoinfo Toolbox provides detailed information about Students, Stops, Hazards, Streets, and other mapped entities. Today’s students often participate in scholastic, vocational, and special programs offered in multiple school or facility locations. Routefinder Pro quickly creates unlimited shuttles and expedites student assignments by simplifying logistics and increasing manageability. This enables you to easily monitor student whereabouts. It also preserves the history of shuttles throughout the school year. Shuttles provide unlimited school-to-school potentials for the growing number of scholastic, vocational, and special programs that require children to be transported from one building to another. You can now access a comprehensive Report Library which contains a wide variety of customized reports created by our Support Team at Transfinder. You can preview them and download a selected template into your system and your data will automatically populate the report. Standard Reports and State Reports house a complement of reports that meet common or state-specific requirements. Reports designed specifically for your district are stored in a personalized My Custom Reports. The Report Library gives you access to a comprehensive library of custom reports. Preview and download a template for your use and your data will automatically populate the report. Built into Routefinder Pro is a comprehensive management system for smooth, district-wide field trip coordination and communication. - Categorize expenses to identify appropriate budget and avoid cost overruns. Routefinder Pro provides built-in reminders to give you advance notice on steps you need to take to meet state requirements for vehicle upkeep and staff development. By creating unlimited “what if” scenarios, you will be able to minimize the effects of redistricting on students, district personnel, and the community. Should your state regionalize operations or consolidate resources, you can also utilize Routefinder Pro to more efficiently operate transportation services across multiple districts. Routefinder Pro gives you the ability to incorporate multiple county maps within your system to streamline shared services, a key feature developed by Transfinder to meet this challenge. Routefinder Pro has everything you need to manage your transportation operation more effectively.